The Riser is a powerful software instrument for designing musical transitions of epic proportions. A synth-based instrument, The Riser features all of the tools you need to compose heart-stopping transitions in one intuitive user-interface. In seconds, you can construct rises, falls, swells, fades, and more, based on Air Music's coveted sound synthesis technology. For instant inspiration, The Riser includes 300 pro-grade presets that you can edit, deconstruct, copy, mangle, and implement into your tracks. Transitions add suspense, hype, drama, and movement to your music. Cymbal swells and reversed instruments were go-to transitions for years, until the DAW pioneered fast and flexible audio editing, paving the way for complex sound effects. When combined with synths and other audio shaping tools, transitions completed their metamorphosis from science to art. Until now, this process has convoluted and time-intensive, taking attention away from the overall project itself. The composer spent more time trying to get plug-ins, virtual sample players, hardware effects, sound modules, and other gear to play nice with each other – and that was before hitting “record”. 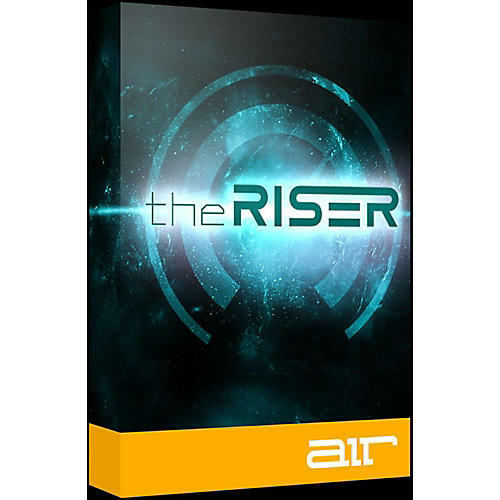 Featuring one of the most powerful and musical virtual synthesis engines available, The Riser can be used to create classic transitions or effects never-before-heard by human ears. The core of The Riser’s mojo are three continuously variable oscillators; sweep, noise and chord. Each oscillator features a dedicated Filter send and graphical parameter depiction. All the essential effects for transition design are inside The Riser, for fast access to studio-grade audio manipulation heaven. A tempo-sync’d delay with time-division can slap or drench your transition with the subtlety of a feather – or sledgehammer. To add space to your patch, mix in one of four reverb types, all of which are completely adjustable to complement your track. To really grab the listener, there's both Panning and Width controls, letting you master stereo positioning and intimacy. The Filter section features over 20 types, ranging from low-pass, high-pass, band-pass, multi-pole/pass combos, band reject, and phase shift. When used in concert with The Riser’s LFOs and variable oscillators, you get standout results with signature flair.